In the unlikely event that a member uses his or her subscription every day of the month, he or she would only pay a rather cheap 17 cents per cup. Burger King is said to be creating a “community” around its coffee and breakfast options, and aims to peel off traffic from Dunkin Brands (NASDAQ:DNKN) and McDonald’s (NYSE:MCD). The good news for SBUX stock is that, despite the ample media attention, Burger King is hardly a threat to Starbucks. McDonald’s has already offered cheap coffee as part of its breakfast package for years. It’s never been clear that there is a huge overlap between Starbucks’ and McDonald’s customer bases. As a result, Burger King’s invasion of the market is unlikely to shake up the sector either, though it likely will hurt McDonald’s and Dunkin Donuts at the margins. That said, Starbucks stock has plenty of other issues, even if Burger King’s initiative isn’t one of them. At the end of the day, the combination of the high valuation of Starbucks stock and its limited growth prospects make it hard to endorse the stock, particularly as it trades near its new, all-time highs. You’ll almost certainly be able to buy Starbucks stock at a cheaper price later this year. Is Starbucks Stock Really So Expensive? A standard bearish talking point on SBUX stock is that its price-earnings ratio is quite high. That has only become more true as Starbucks stock has rallied in recent months. 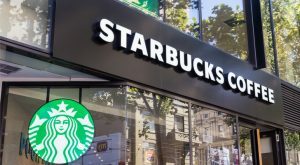 With the stock now trading for more than $70, Starbucks is selling at 32 times its trailing earnings and 24 times analysts’ consensus 2019 earnings estimate. McDonald’s, by comparison, is trading at 24 times its trailing earnings and 21 times its forward earnings. Restaurant Brands, (NYSE:QSR), the owner of Burger King and Tim Horton’s, has around the same multiple as McDonald’s. Dunkin Brands is slightly pricier than either of those, though cheaper than Starbucks. Meanwhile, the suddenly hot Chipotle (NYSE:CMG) is back over 40 times its earnings despite all its problems over the past couple of years. Against that backdrop, you can make a case that SBUX stock isn’t that expensive compared to its rivals. While a case can be made that the valuation of Starbucks stock is reasonable, I’d argue that’s more because restaurant stocks as a whole have become overvalued. Looking at Starbucks in isolation, rather than against its sector, it’s clear that Starbucks stock is pricing in some strong growth in coming years. That said, for this year, analysts on average predict SBUX will report 6% revenue growth and 12% earnings growth. Those numbers are fine; they’re quite good, in fact. for a company that is already as large as SBUX. But for a stock that’s trading around 30 times its trailing earnings, that growth still isn’t that impressive. Keep in mind that Starbucks is benefiting from several favorable trends – such as unusually low coffee-bean prices – that are making its earnings jump more than its revenues. Ultimately, Starbucks will find it hard to keep its price-earnings ratio this high if its revenue continues to increase around 5%. It’s true that Starbucks is still trying to open a ton of stores, particularly in China. But there are limits to how many more stores it can open in many markets. This is close to a mature brand at this point, while SBUX stock is back to trading as if the company can still grow vigorously for years to come. While China is clearly Starbucks’ most important market at the moment, don’t forgot about its U.S. operations. In recent years, the company has struggled to generate any same-store sales growth at home. Its mishandling of the situation in Philadelphia during which two men were wrongfully arrested didn’t help matters either. Starbucks’ most recent results were slightly better. Its same-store sales growth in the U.S. market came in at 4%. Before we get too excited, however, consider that traffic at its stores was merely flat, as its sales growth was entirely caused by higher prices and a more favorable mix of products sold. Unfortunately for SBUX stock, there is a limit to how much its average check size can rise before consumers get irritated. Particularly once the economy turns down again, SBUX will have trouble using higher prices to maintain its sales growth. That’s why it is so important that SBUX is focusing on getting its store traffic up again. It is using several methods to attempt to accomplish this aim, such as tinkering with its rewards program. However, its most important initiative is its decision to reevaluate all of its domestic stores. According to CNN Business, SBUX is looking for ways to make all its stores cater more to local demands. Busy metro areas, such as New York, need more stores where beverages ordered through the app can be easily picked up. The company found that in the Texas market, clients prefer stores with more interior lighting. In New Jersey, there will be more lounge areas for customers to hang out in the afternoons. By rebuilding its store base to meet local needs, SBUX may finally be able to get more people into its stores again. Give credit where credit is due; Starbucks’ last quarter was better than its previous few quarters. And while I’m still skeptical about the company’s long-term outlook in China, so far, it is putting up decent results in the country. Additionally, I see management’s efforts to overhaul its U.S. store base as a wise move. Ultimately, if SBUX stock is going to remain a compelling growth story, it needs to accelerate its same-store sales again, and higher prices can’t be relied upon to do that forever. If SBUX can get more foot traffic into its stores, particularly in off-peak hours, the outlook of Starbucks stock would greatly improve. That said, at this P/E ratio, consider me uninterested in Starbucks stock. The stock is rather sensitive to the overall economy, and should correct pretty dramatically when the economy slows. Continued trade- war jitters between the U.S. and China could also cause another drop in Starbucks stock. With SBUX stock near its all-time highs, investors can wait for a correction before buying any shares. This entry was posted in Bank Stocks on March 29, 2019 by admin.